Todd Boyd warms up during football practice. The junior wide receiver, aims to make a bigger impact this season. 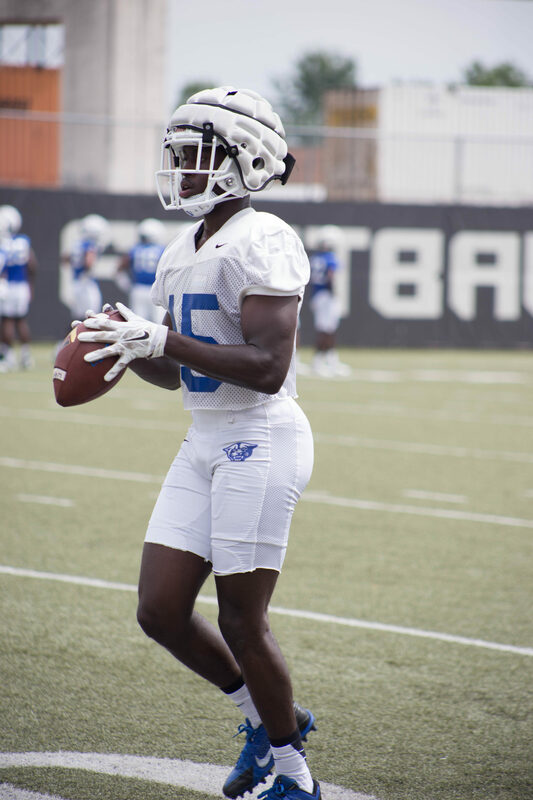 While senior and sophomore wide receivers Robert Davis and Penny Hart instantly come to mind when referring to the Panther’s receiving core, third year veteran Toddarian “Todd” Boyd is projected to showcase more of his abilities during the 2016-17 season. Boyd weighed in on his thoughts of not being in the spotlight as much as his teammates. Boyd’s quiet yet playful demeanor are two qualities that have followed him throughout his lifetime. Being the oldest of four siblings, Boyd has always had confidence in himself while remaining dependable. A native of Colquitt County in south Georgia, Boyd shared about his hometown. Avoiding trouble, Boyd began to play football at age eight. Not receiving much attention until around eighth grade, Boyd went on to play high school football for the infamous Colquitt County Packers. This powerhouse 1-AAAAAA team, Georgia’s largest classification, has received several accolades for their success. Receiving honorable mention all-region honors as a junior, Boyd also helped the Packers reach the Class AAAAAA state semifinals his junior and senior year. Little did Boyd know, this competitive program was shaping him for the next move in his football career. Upon graduating from high school the senior had one offer on the table, but for Boyd this one opportunity was perfect for him. The Georgia State Panthers offered Boyd his football scholarship and after the visit he was set on attending the university. Reflecting back on high school football, Boyd shared how the Packers football program prepared him for his transition to Georgia State. In order for a receiver to build momentum and confidence, he has to be exposed to different scenarios as well as repetition whether it be at practice or on the field. Davis shared one piece of advice receiver coach Tim Lappano tells his receiving core. Boyd entered the Panther’s football program and began to see good reps in practice, which lead to his success during his rookie season. Seeing playing time as a freshman, Boyd totaled eight receptions, 119 yards and two touchdowns, in 2014. Standing as his career high in yardage, Boyd totaled three catches for 91 yards including his first touchdown for 21 yards against Troy. Carrying over this force into his sophomore season, Boyd increased his numbers, landing him at the fifth leading receiver, totaling 25 receptions, 296 yards and two touchdowns. Obtaining a career high of four catches against Oregon, Boyd was able to catch a 14-yard touchdown pass against the Ducks. Totaling three catches for 63 yards against Texas State, Boyd continued to set records for himself by catching a 45-yard reception. Which currently stands as his career high longest reception. Out of the 34 games that Boyd has seen playing time, one game stands as the most memorable to him. Catching the 19-yard touchdown pass in the fourth quarter gave the Panthers a lead over San Jose State in the AutoNation Cure Bowl, but despite their best efforts Georgia State fell to the Spartans 27-16. Boyd finished the game with three catches for 56 yards. Boyd hopes to land a starting position this season. While recognizing his explosion and route running as two of his strengths, Boyd is also diligent about working on his weaknesses. The team helps each other become better players by bringing that competitive mentality to every practice. Bobby Baker, redshirt senior safety, previously commented on why he enjoys covering Boyd in practice. It turns out that Boyd welcomes this challenge and looks forward to going against Baker along with two other defensive players. Between consistency, good reps and increasing his competitive streak, Boyd is set to achieve higher numbers this upcoming season.